HAPPY MAY DAY 2015! Yes, my kids remembered May Day and sent me texts of emoji flowers this morning. Both of them remembered me while battling midterms and finals. I sent my mom a basket of flowers today, too. I’m waiting for her call. Here’re my reflections of May Days past. 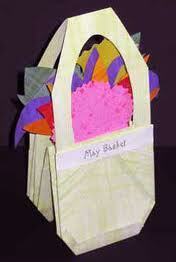 In first grade, my teacher Mrs. Iverson showed us how to make May Day baskets from pink and yellow construction paper. We drew ivy and flowers on the paper baskets with our thick crayons before going up one-by-one to our teacher to get the handle stapled on. On the way home from school, we walked together picking dandelions and soft lavender-colored clover to fill our baskets. 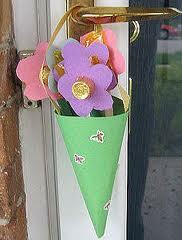 We took turns “May Daying” the neighbors.